Yesterday we dug through our book collection and pulled out all of our favorite Nursery Rhyme books to get ready for our Virtual Book Club for Kids' NURSERY RHYME WEEK! Once all of our books were out we started brainstorming which nursery rhymes we wanted to spotlight this week. There are so many fun ones, so it is hard to pick! My 6-year-old and 4-year-old have been a bit obsessed with having tea parties lately, so we decided to kick off the week by spotlighting I'm a Little Teapot. I'm a Little Teapot by Annie Kubler is a great simple board book version of the nursery rhyme to check out, if you don't have one. I love using board books with toddlers and preschoolers because they are so durable. We are big fans of painting right now after some crazy cardboard box painting fun during our 10 days of toddler activities challenge. Instead of using a box, we decided to try out painting using our teapots! Grab a pan to get started and put some paper towels inside the pan to line it. 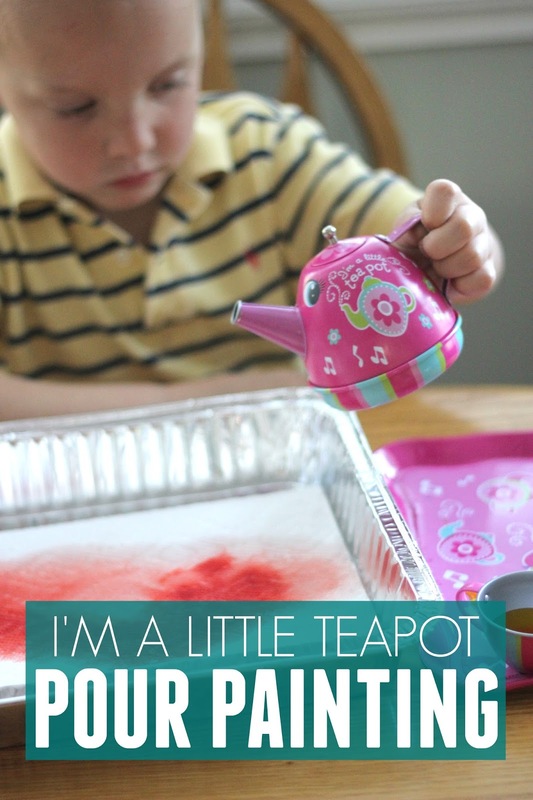 Next, mix some liquid water colors with water and add it to your teapot and your tea cups! Now you are ready to paint! Teapot pour painting is a fun way to mix colors! My kids just poured the cups and the teapot onto the paper towels and had fun watching to see what colors they made! Once we ran out of colored water we remixed up more paint solution and refilled the pots and cups! I used plenty of liquid watercolors to make the colors extra vibrant! 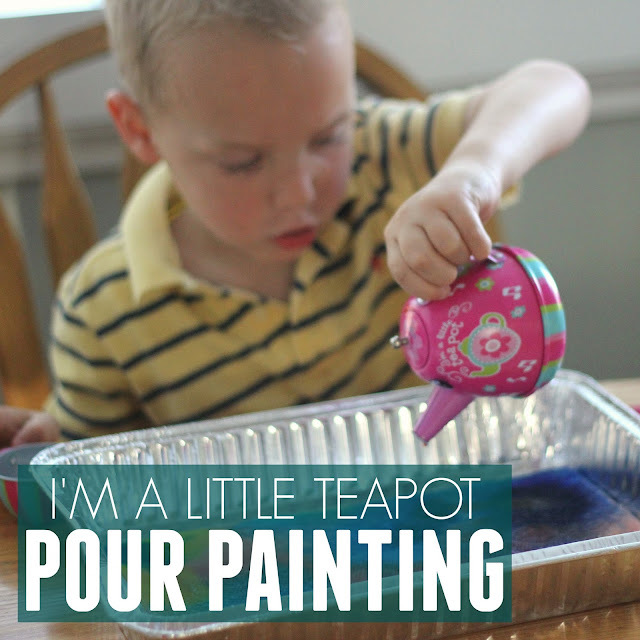 This simple painting activity was extra fun because our teapot actually sings, "I'm a Little Teapot." We started giggling every time it started playing the music. This simple painting activity was so silly and my kids kept wanting to do it again and again! We need to restock all of our liquid watercolors now! Have you ever created anything with a teapot before? Do you have any other favorite unique ways to paint? If you're not already part of our Weekly Virtual Book Club for Kids, come join in! We have a great Weekly Book Club for Kids Facebook Group where we share loads of ideas each week! Once you're done trying this simple teapot painting activity, scroll down to try out some of the other awesome nursery rhyme themed activities from our Weekly Virtual Book Club for Kids co-hosts. NURSERY RHYME THEMED ACTIVITIES FROM OUR CO-HOSTS! Want to join our Nursery Rhyme Week? 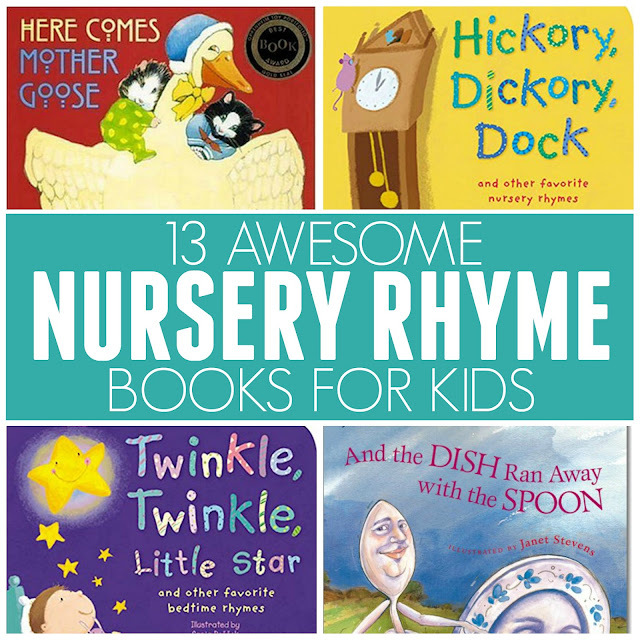 Check out these 13 AWESOME NURSERY RHYME BOOKS FOR KIDS and pick one to enjoy this week! Make sure to come back later this week to see our other nursery rhyme activities.